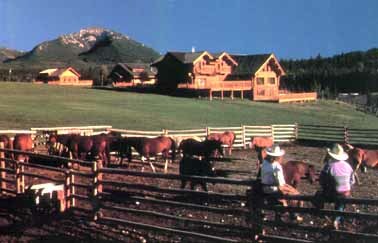 Echo Valley Ranch rests just outside the bounds of "civilization" and contains within it all the amenities you've come to expect from a world-class resort. The best part of the ranch was already here when we arrived. An unsurpassed peace and beauty permeates the land. The difficult was in building a place that complimented rather than competed with what nature had already done. We think we've succeeded. Rustic lodge and cabins contain all the creature comforts, fine food, drink and good company you'll ever want after a day in the saddle. Fly-in fishing, 4x4 safaris, trail riding, corporate retreats and honeymoon packages are available.